I will devote this blogspot to being a Carroll Gardens archival resource, to promote maintaining our neighborhood in a manner that preserves, recognizes, and respects its contextual and historical significance and architectural integrity, and to protect our local heritage from the challenge of out-of-character development. The tower was described as about eighty feet, and it slopes gradually in from the base until it reaches a sharp point at the top, which is ornamented with a Corinthian capital. The church and tower were constructed about eighteen years ago, and during its construction a shocking accident occurred, which resulted in the instant killing of two men and serious injury to several others. The casualty was caused by the falling of a scaffold in the interior of the edifice. 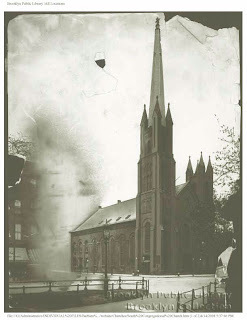 The article described that it was not a matter of surprise, to those who resided in the neighborhood and had observed the steeple moving from one side to the other during more than ordinary severe gales, that it has not fallen long ago.